In the Southwest, there is a long-standing tradition at Christmas to fill little paper sacks with sand and place lighted candles inside. 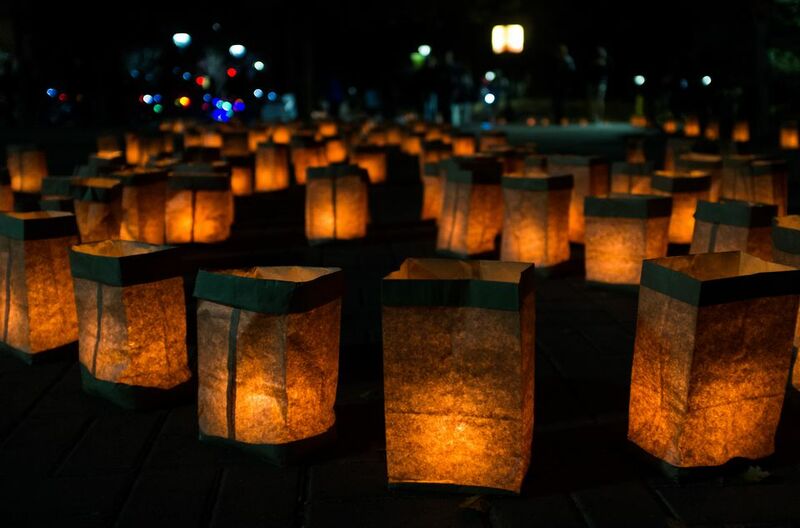 These luminarias (or sometimes they are called farolitos) are used to line sidewalks, walkways to homes, and businesses and the flat rooftops of adobe buildings. Originally the warm lights were placed to light the way for the spirit of the Christ child to one's home. Today, this type of beautiful lighted display can be seen in such places as Santa Fe's Canyon Road, where a special celebration takes place Christmas Eve, and at the Desert Botanical Garden of Phoenix where all the garden walkways are lighted with luminarias. And, of course, individual homes are decorated with home-made luminarias. It isn't difficult to create a beautiful seasonal display with luminarias. Luminarias, or farolitos, are simple to make and create a southwestern holiday display that brightens any home. Luminarias are easy to make and it should take less than 1 minute per luminaria or 15-20 minutes for an entire household luminaria display. Open a brown paper lunch bag and fold down the top inch to create a lip at the top of the bag. Put enough sand or dirt in the bottom of the bag to keep a votive candle upright, about 1 inch deep. Place a votive candle in the bottom center of each bag. The candle should be about 3 inches in height so that it can burn through most of the night. To make an entire display of paper bag luminarias, decide where to put your line of lights. Pathways, walls, and fences work well to show off your display. Once you have decided where to put your display, estimate how many you will need. Plan for enough bags to put a paper bag lantern every one to two feet. Take the filled bags you have made and place them every one to two feet along your chosen driveways, pathways and walls around your home. At dusk, use a fireplace lighter (long-nosed) to start the candles to avoid setting the bags on fire. Enjoy your holiday luminaria display and replace the candles as needed each night. In Albuquerque, free and public sand piles appear around town for the displays. Check with your neighborhood association to see about availability in your area. Votive lights are sold by the box in Albuquerque stores during the holiday season. Don't wait until the last minute to buy, as they are often sold out by Christmas Eve. Reuse your luminaria dirt or sand for your garden area. If you are concerned about flickering flames catching fire, consider using battery-operated votive candles which are available online and in craft stores. You will still need the sand to weigh the bag down.